Now that we are in the second half of Lent there is a shift in the tone of the season. Rather than a penitential tone the season begins to look ahead to the salvific work of Jesus’ passion, death and resurrection. God’s great gift of Jesus’ redemptive offering of his life so that humankind no longer need be a slave to sin should bring us great joy. We are joyfully anticipating the approach of the Easter Triduum. As we move closer to those days when we commemorate the salvific passion, death and resurrection of our Lord Jesus Christ we should begin to feel excitement. Lenten Folders-Parishioners received a Lenten Folder before Lent began. We ask you to put aside a quarter a day for a total of $10 over the entire Lenten season. Your donation will be combined with those of other parishioners’ and sent to Food for the Poor to build a modest home for a family in Haiti. The cost of a home is $3,600. Last year parishioners donated $4,000. A poster with a picture of the Montrevil Family of Plaine Du Nord, Haiti in front of the house we built for them is at the front of the church by the baptistry. Come take a look. How about building two homes this year? Additional Lenten folders are available to be picked up at the back of the church. Beginning on Palm Sunday we will have collection boxes at the front of the Church to collect your completed folder. Friday Program-On the Friday afternoons of Lent we recite the devotion of the Stations of the Cross in the Church at 4:30PM. Each week a different parish ministry will lead the recitation of the Stations. The version of the Stations used will reflect the theme of their work. This Friday the Stations will be led by the Pastoral Council and Finance Committee. They will be leading Stations of the Cross for Today’s Disciples. Praying the Stations usually lasts about thirty minutes. After the Stations you are invited to share a simple supper of soup, bread and beverage. Following the meal, a short twenty to thirty-minute presentation of a segment of Bishop Robert Barron’s program, Priest, Prophet, King, will be offered. Come join us for all or any part of the program. This Sunday, April 7, 2019 the parish will hold its Lenten Reconciliation Service at 4 PM. There will be several priests available to hear parishioner’s confessions and the First Reconciliation class will celebrate the sacrament for the first time. Plan to celebrate Reconciliation with us in preparation for Easter. Next Sunday is Palm Sunday the beginning of Holy Week. Holy Week and especially the Sacred Triduum of Holy Thursday, Good Friday and Easter is the most sacred time of our Church Year. Please plan to clear your calendar so that you can participate in as many of the liturgies of Holy Week as possible. Monday, April 15, 2019 Reconciliation/Confessions 4:00-6:00 PM. New this year, Tenebrae is Latin for "shadows" or "darkness." It can also be translated as "night" or "death." The Tenebrae service is an ancient tradition in Christian history. The purpose of this service is to remember the somber events that occurred in Jesus' life from the exuberant entrance into Jerusalem on Palm Sunday through the night of Jesus' burial on Good Friday. The most distinctive aspect of the service is the use of a Tenebrae "hearse," a holder for several lit candles. The flames of these candles are extinguished one by one as Scripture readings are shared to tell the story of Holy Week. This gradual descent into gloom is a representation of Jesus' increasing sorrow as the events of Passion Week unfolded. After the last verse is read, the last candle is put out, and the room is plunged into darkness. 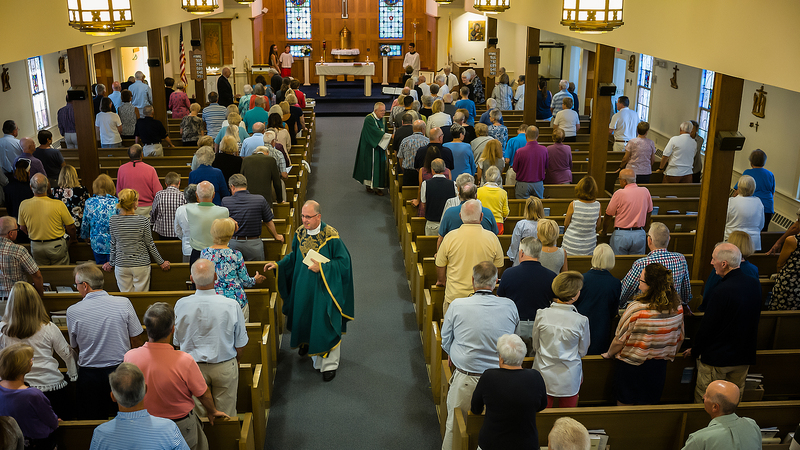 Sunday, April 21, 2019, Easter Masses: 8:00 AM, 10:00 AM, 12 Noon. Those who sexually abuse minors don’t look scary. They appear as normal people. Be aware of some of the grooming techniques used by abusers. They often want to be alone with children, in areas where no one can monitor their interaction with them. They want youngsters to do things that parents would not permit their children to do. The are more excited to be with children than adults. They discourage others from participating in activities involving youngsters. Proactive awareness is the best defenses against sexual abuse.